The big crumb-le came out of a desire to address what I believe is a fundamental design flaw in the the fruit crisp: they don’t stay crisp. Especially for gluten-free crisps and crumbles, they come out of the oven perfect, but unless you shove it all in you face right then and there (not that there’s anything wrong with that), the topping gets soggy. In my experience, the crispies and the crumbles aren’t substantial enough to stand up to the fruit ooze. Yeah, it just got scientific. Big crumbs are the answer. Big crumbs, as seen here in their usual habitat on top of the big crumb coffee cake, are basically big chunks of butter, flour, and sugar. The secret to big crumbs, is using melted butter and letting it cool before adding it to your flour mixture. This lets harden, almost like a pie crust, leaving you a big slab of solid crumb that you can break up into hefty chunks. Turns out, baking stuff in jars can be kinda controversial (check out the comments on this kitchn post). I did it because I don’t own ramekins, but I DO own canning jars. If you own ramekins, but not canning jars, definitely use them here. I imagine you could also use a pie plate, but the amount of fruit in this recipe isn’t quite enough for a 8×8 square pan. Mix the rhubarb with the following 4 ingredients and set it aside to let the juices develop. While mixing all the remaining ingredients except the butter, melt the butter in a small pan over low heat. Add the melted butter to the dry ingredients and stir to combine. It may be easiest to use your hands. Bring the mixture together with your hands and let it sit at room temperature for 10 minutes. 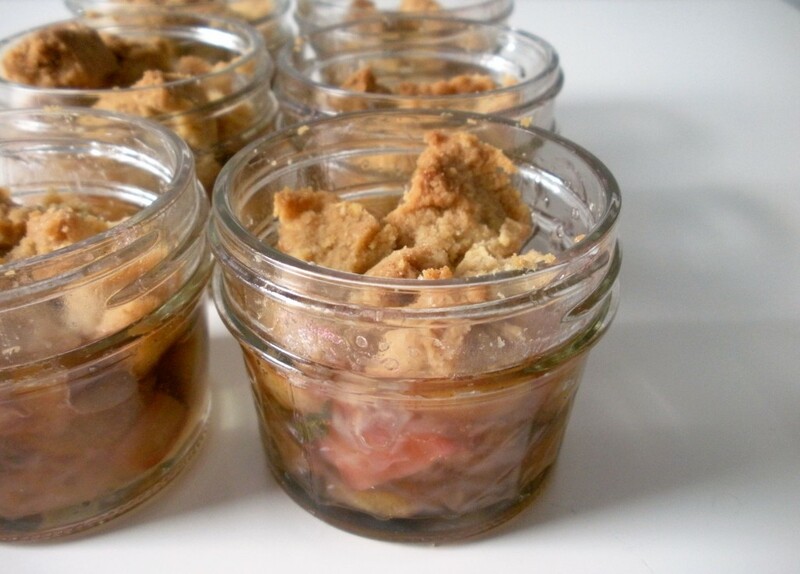 Grease 6 4-ounce jars and distribute the rhubarb mixture evenly between the jars. 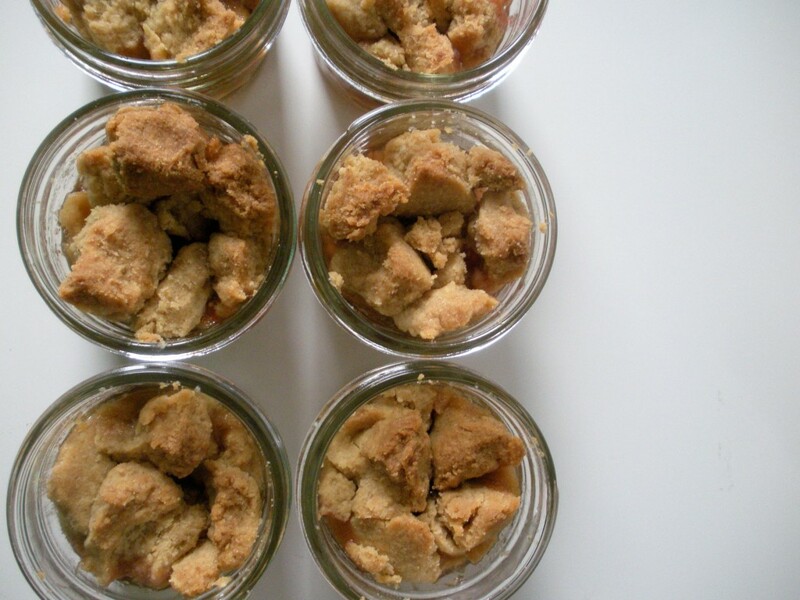 After 10 minutes, begin to break the crumb mixture into chunks and cover the top of each jar. Place on a baking sheet in the oven and bake 30-40 minutes, or until the crumbs are nicely brown and the rhubarb mixture is bubbly. This recipe is adapted from here. People love it. If you make this in jelly jars like me, you’ll probably have a bit of crumble mixture left over. I wanted to include a generous amount, in case folks use something with more surface area than jelly jars. I say, bake the extra and use it as an ice cream topping. I used Bob’s Red Mill AP Gluten-free flour here, but you can try the one you prefer as long as it doesn’t have any leavening agents. 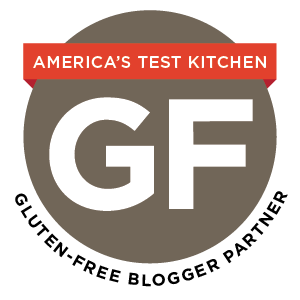 If you’re not gluten-free, use 1 3/4 cup cake flour. Thanks, Aimee! You’re so right about Rhubarb. The time is definitely right. Hi, you didn’t say how much butter to use in your ingredients. Thank you! I sure didn’t. Thanks for catching that!